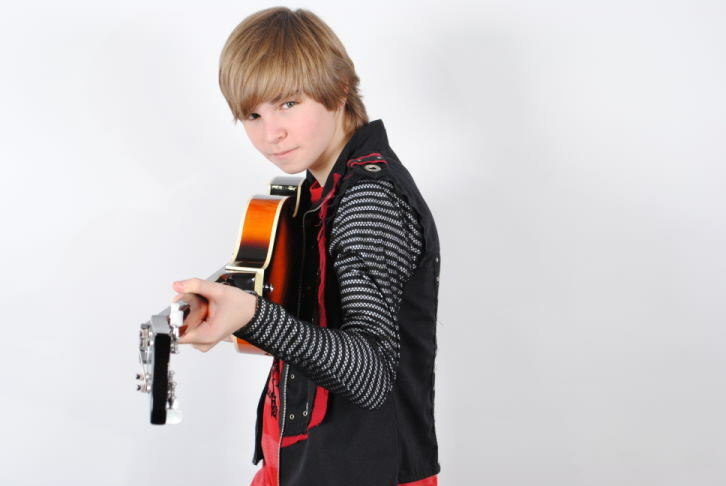 In addition to his extraordinary singing ability he also plays the guitar and demonstrates a charismatic personality. This boy truly has the whole package to become a teen idol not just in Mexico but internationally. With his charming looks, outgoing personality, confidant and strong ability to perform both on and off camera, makes Alan Wheeler a true talent to be reckoned with! That article also included an exclusive shout out video where he promised to let us know about some very special things that he was working on. Alan recently contacted us and presented us with some very exciting news! Alan has moved from Monterrey Mexico to Beverly Hills to finish High School and to continue his music and acting studies. Since arriving in LA, Alan and his sister Chris have been busy getting to know their new home, getting settled into a new school, exploring the area and beginning a new stage of their lives. Alan has enrolled in one of the most prestigious youth acting programs in the country: Gary Spatz’s Playground and is looking to take his singing talent to Television and the Big Screen! He is also looking forward to finalizing an agreement with a Talent Agent soon. Each Friday evening Alan continues his USTREAM.TV broadcasts, where he and Chris interact with their fans, performing to their requests, singing their favorite tunes and just having a good time. The change of time zones has taken some adjustment for everyone, trying to make the most of the opportunities available in LA while keeping the weekly appointment with Alan’s fans. Routine “guests” on the broadcast include Chris’ Perry (The Platypus stuffed animal), Paul the family’s Chihuahua, and the Kid’s mom Perlita. Monterrey’s Alan Wheeler – Wheeling to Success! Monterrey, Mexico Teen Idol Alan Wheeler has been very busy since our amazingly popular introductory article was published last February. That article received more comments than any article that was ever published on this blog and today still holds the record! None of the credit lies in the authorship of the article, but rather in the overwhelming support that Alan receives from his many fans and followers! Alan’s father, Robert, reported today, that Alan has been kept extremely busy enjoying many performance opportunities and always seems to be booked with a gig resulting in much traveling! Back in May, Alan and his father visited LA for a week to meet with some industry representatives. He reported that the visit was not only interesting but productive as well. They hope to hear BIG NEWS very soon that they can share with us! This past week, Alan and his sister Chris have been in Los Angeles attending the Hollywood School of Rock Music Camp which wraps up with a Feature Showcase at “THE MINT” on Pico Blvd in LA. All the leaders of the entertainment industry have been invited, it promises to be QUITE THE SHOW! Author RivenmasterPosted on July 24, 2011 September 10, 2011 Categories Alan Wheeler, Featured, Young Male Artists A-LTags Alan Wheeler, boy, Cody Simpson, Greyson Chance, I For You, Jordan Jansen, Justin Bieber, Mexico, Monterrey, Pop, singer, Sleeping With The Light On, Talent, Teen, Teen Idol, vocalist, youth47 Comments on Monterrey’s Alan Wheeler – Wheeling to Success!